Hydrangeas have a die-hard group of fans out there, and if you’re one of them, you might consider adding this lovely variety to your landscape. This new variety – the Everlasting Revolution – should be available in your local garden center or nursery this spring. 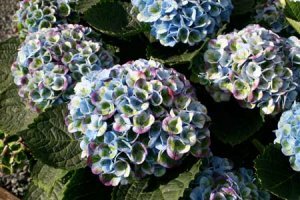 While hydrangea blooms can vary in color, depending on your soil pH and the variety you chose, this particular plant actually changes color throughout its blooming period. It also blooms on both old and new wood, so you won’t want to trim it back when the foliage dies in the fall. Check it out – maybe you’ve got just the right place in your yard for this charmer!